1-CD Digipak (4-plated) with 72-page booklet, 32 tracks. Total playing time approx. 86 minutes. to his recordings as comic alter-ego Simon Crum, Ferlin's talent for rockin' and boppin' is on full display. Explore a very different side of the smooth-voiced crooner whose 1957 recording of Gone helped usher in the pop-influenced Nashville Sound. Packed with 32 tracks, including six charting hits, two previously unissued recordings, and rarities released on CD for the first time. Beautifully illustrated booklet packed with many rare and never-seen photos. Extensive liner notes by Scott B. Bomar, featuring in-depth biographical information and insights culled from unpublished interviews with Ferlin, Jim Ed Brown, Dallas Frazier, Jan Howard, Ken Nelson, Jean Shepard, Leona Williams, and many others! 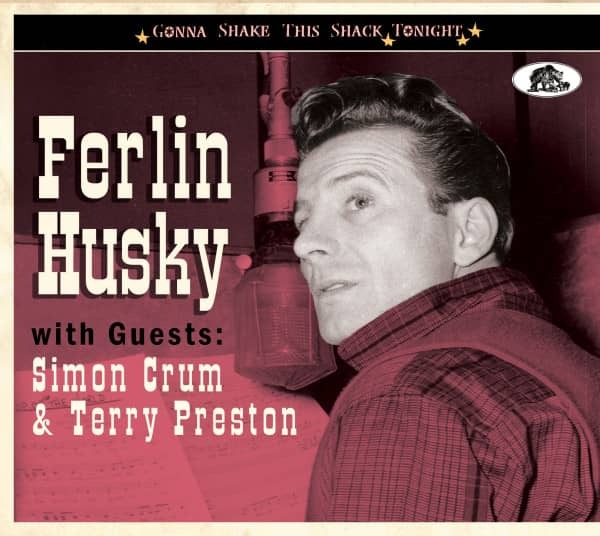 Ferland Huskey was born in southeastern Missouri, and went on to be known by many names during his career: Ferlin Huskey, Tex Terry, Terry Preston, Ferlin Husky (without the 'e'), and Simon Crum, a comic alter-ego whom Ferlin demanded be treated as a separate person. The musical ground he traveled was as diverse as his various identities. 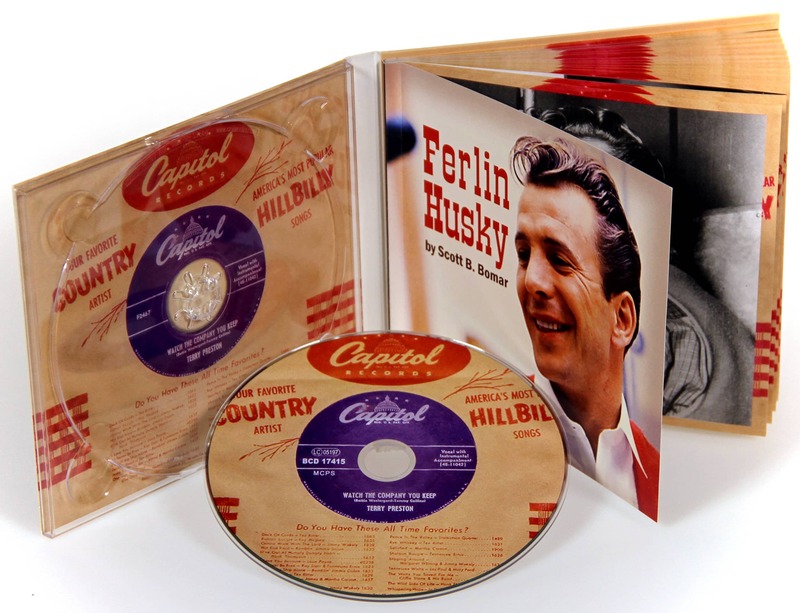 Adept at smooth countrypolitan polish, rough-hewn backwoods toe-tappers, funny off-kilter novelties, earnest recitations, or rockabilly-infused boppers, one could pick virtually any theme and assemble a solid collection of Ferlin Husky material. Starting in the Missouri honky tonks as Tex Terry, Ferlin relocated to California in late 1948, where he joined Big Jim DeNoon's band in Salinas. It was through DeNoon that he landed his first record deal on the 4 Star label. When he began touring with Gene Autry sidekick Smiley Burnette he changed his name to Terry Preston. He eventually moved over to Capitol Records around the same time he moved to Bakersfield. It was during his Bakersfield period that Ferlin began introducing Simon Crum to audiences on his daily radio show. 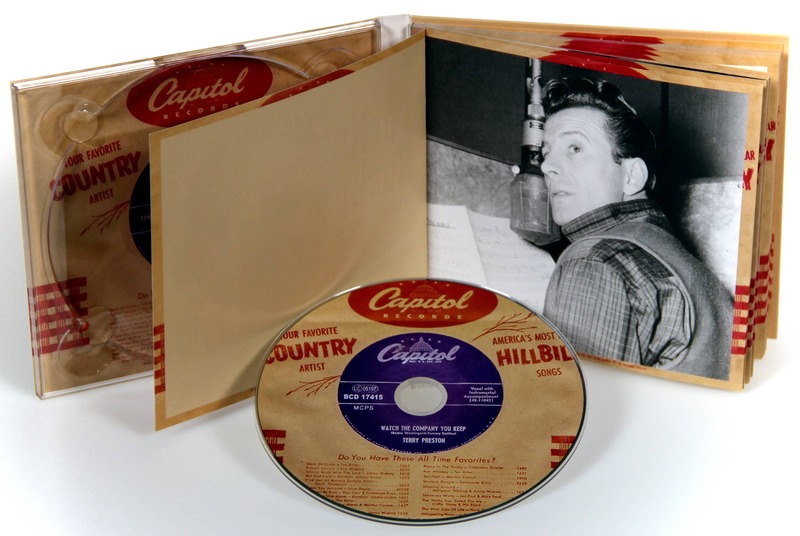 In 1953 he began recording songs in the Hank Williams style which were issued under the name Ferlin Huskey. He had his first #1 hit later that year with the Jean Shepard duet A Dear John Letter. By 1954 he had permanently relocated to Nashville, where he became a member of the Grand Ole Opry. While smooth Nashville Sound hits such as Gone and The Wings Of A Dove came to define him, Ferlin's recorded output is incredibly diverse. He was just as likely to rock as he was to croon! 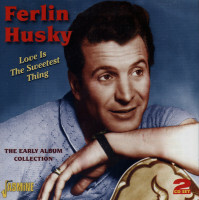 Ferlin Husky was a unique American country music superstar. He was born Ferlin Eugene Husky on December 3, 1925, on a farm in Cantwell, in the east Desloge area, Missouri. One of his uncles taught him how to play guitar before age 10. In his latter childhood he became interested in music, especially those by Red Foley and Bing Crosby. Then there was World War II interrupting Ferlin's musical start. He became a fighting soldier at age 19, and was sent over to the European theatre. He was a gunner on a troop vessel and experienced the horror of D-Day at the coast of Cherbourg, Normandy, France, June 1944. Directly after the war Husky began working as a dee-jay in the California area of Bakersfield. Western star Smiley Burnette hired him for a tour but forced him to change his name. 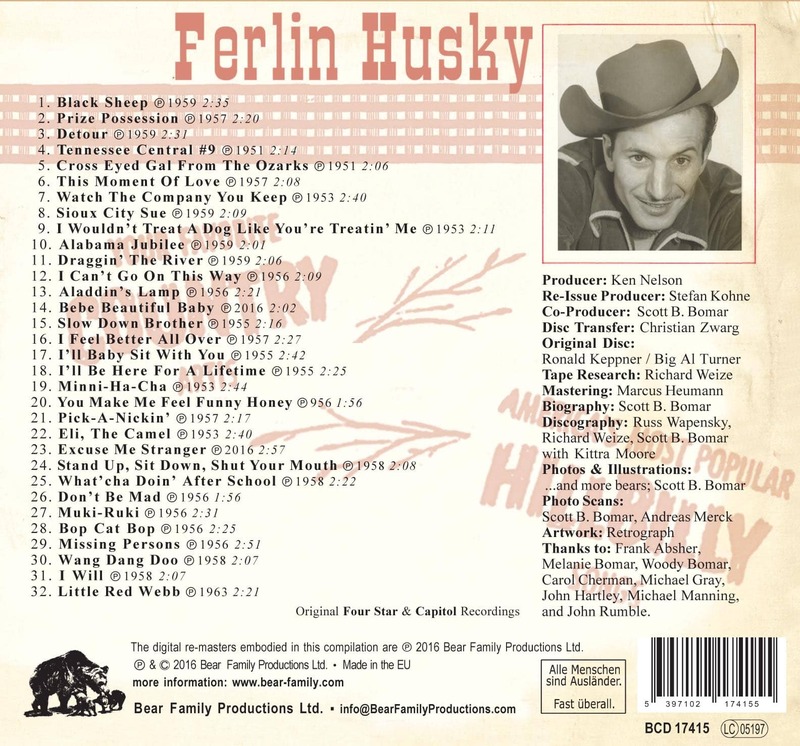 Burnette said, Ferlin Husky does not sound country. Ferlin started working under his first pseudonym, Terry Preston, on tour as well as on appearances in local honky tonks and juke joints in and around Bakersfield and also on various studio sessions backing other artists as a bass player. Husky soon got his first record deal signed with the small label Four Star and a series of 11 singles was released during 1949-1951. They went well locally but not nationally. Therefore he moved from Four Star to the bigger Capitol label in '51. 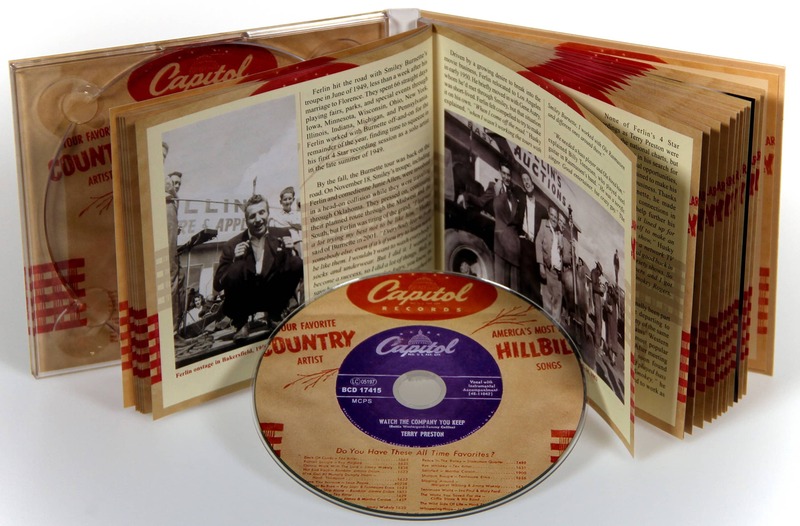 The connection to Capitol came from Tennessee Ernie Ford's manager who was very impressed by Ferlin's live appearances. 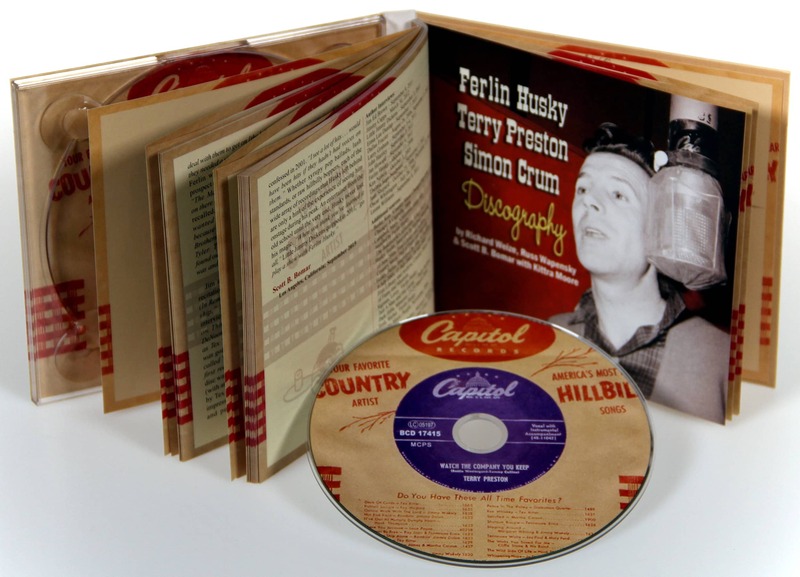 The first 7 Capitol 45-singles were still released as by Terry Preston – the pseudonym. 1953 saw the 8th single, 'Hank's Song'. It was the first issue under his real name Ferlin Husky. A solid number that sold well. 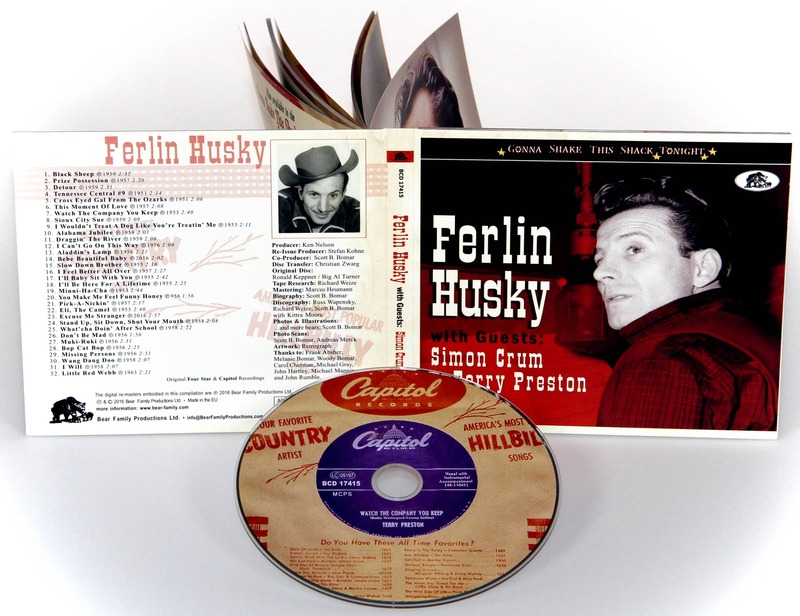 Meanwhile Capitol went on to use the pseudonym Terry Preston on various Husky issues up until mid-1954. It happened then, that Husky recorded a duet with Jean Shepard, called 'A Dear John Letter' which became his first million seller. It climbed to #1 on the Billboard country charts. The song tells the story of GI John who just returned from the Korean war. John received a letter from his beloved girlfriend who quits the liaison with him as she fell in love with John's brother. This 'Dear John Letter' took America by heart. The right song at the right time. A duet answer song followed soon after, 'Forgive Me, John', became another top selling hit. But it took until 1957 when Ferlin Husky had his first solo hit. 'Gone' was a #1 hit on Billboard's country charts for 10 weeks! It climbed to #4 on the Billboard pop charts. Husky could rerun the charts with 'Wings Of A Dove' in 1960. Meanwhile Ferlin started another career under his second pseudonym. 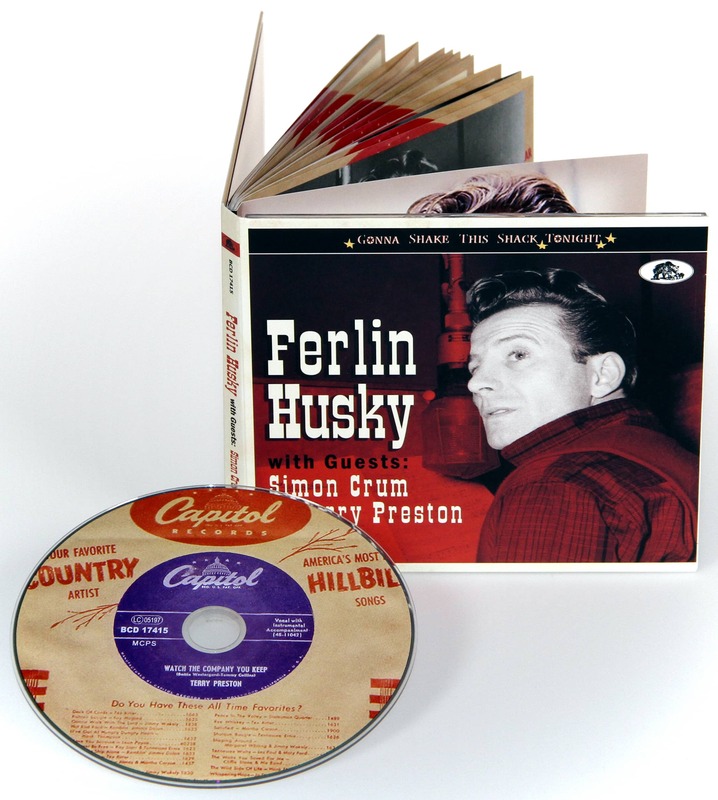 The mid-1950s saw a country comedy act called Simon Crum with similar success as Ferlin Husky. Best chart position for Simon Crum was the song, 'Country Music Is Here To Stay' , in October 1958, #2 dof the country music charts. Even more successful were his TV appearances when he impersonated popular American singers, including female (!) singers, the mocking way. During the first years of the decade 1960s Ferlin's career went lower. He was still in the charts once in a while but his label Capitol Records started to focus on the California surf music wave and soon on the Beatles and the British invasion. Another main pillar of Husky was acting. He played quite a few roles in Hollywood movies, especially in the 60s and 70s. One of his most successful movies was 'Las Vegas Hillbillies', 1966, alongside Jayne Mansfield. Ferlin changed labels again in 1972 moving forward to ABC Records. Unfortunatly Husky had to face several interuptions of his career in the 1970s due to health problems. He was inducted into the Country Music Hall of Fame in May 2010. 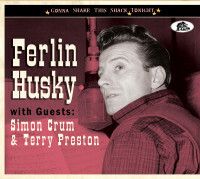 Ferlin Husky died on March 17, 2011 at the age of 85. Customer evaluation for "Gonna Shake This Shack Tonight - with Guests: Simon Crum & Terry Preston"
Record Collector 07/15	"Virtually everything you need to hear is firmly in place." 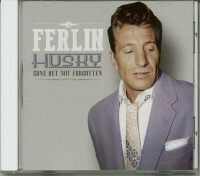 Oldiemarkt 4/16	"Die 32 Lieder auf dieser CD decken Ferlin Husky's gesamtes Spektrum ab und zeigen seine hohe Qualität"